Please excuse the photo quality- it’s from the 80’s. I have no excuse at all for my hair. It was the late 1980’s, and a bunch of us from the barn went to see the Lipizzaners when they came to town. It was a chance to dress up, eat an overpriced meal together, and see some fancy European horses. We complimented one another’s personal hygiene and off we went. We were western riders mostly, but I’m sure at some point all of us had seen the Miracle of the White Stallions. The miracle in the movie title refers to the rescue of the Lipizzaners during WWII, but to my eyes- the miracle was that horses could dance. Do you remember first time you saw dressage? Yes, I knew these horses weren’t the real Lipizzaners, and yes, an exhibition ride is not real dressage. In hindsight, I’m sure I could find fault. I don’t care. Instead I sat mesmerized- riding my front row seat and taking shallow breaths. What did that feel like? I dreamed of those dancing white horses all night long. The next day, I bolted out to the barn. 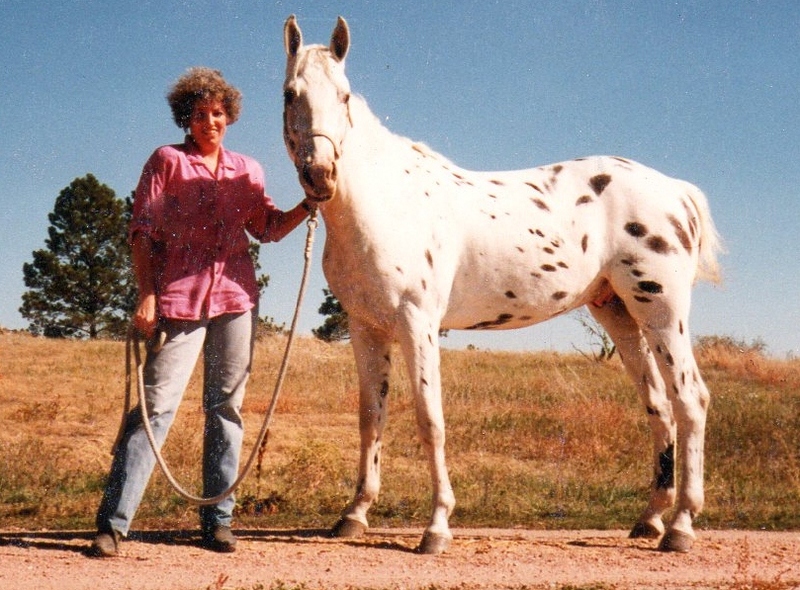 Spirit was a young horse then- a leopard appaloosa, with loud spots on his rump that looked like water running over rocks. I would like to say he was terribly athletic, but no, the truth is neither of us were anything special. He was a bit contrary, just like me, and we were just starting to find our fit. My head was filled with white stallions as I groomed him. I have one of those extremely visual brains so it replayed the Lipizzaner performance effortlessly. Spirit probably saw them them as clearly as me. I’m sure I sat a bit differently in the saddle, I’m sure my energy was high. As we began to work, Spirit’s steps evolved to something else. They were big, soft steps, and when I laughed, they got even bigger. His trot threw me up in the air and caught me, slow and exaggerated. His canter was uphill and the speed of a walk. We had a half-pass without knowing its name. And pirouettes- really? Was I dreaming? A friend came into the arena and let out a loud cat call. If I was imagining it, so was she! The movements faded in a few days. Dressage takes a core of training and strength that is much more literal than my imagination. I was left with a memory of being lifted and carried by Spirit in a some magical way. We had a new goal, and no idea where to start. Note to self: Be careful what you wish for… Spirit seemed to keep a memory of those rides somewhere inside, too. Maybe my mental images were a bit grandiose, but he went along. And in two months, Spirit lost every spot he had. My loud appaloosa was abruptly solid white. Maybe Spirit liked the way he felt as a Lipizzaner. Maybe it was a coincidence. It’s okay if you’re cynical. And it’s okay if you giggle like a horse-crazy girl. Horses have a way of fulfilling our dreams- just the way we dream them. Spirit taught me the power of positive thought and visualization. Is there a bigger gift than possibility? Spirit will have his 25th birthday this month. He came to me at a very challenging time and reminded me who I was. So many years have passed and now I’m the one who reminds him. We share a life. Recently I was asked to write a current trainer’s bio. I should name drop the famous trainers who have guided me, but even now, I’m dreaming of white horses. When it comes to giving credit, Spirit is at the top of the list. He is the list. The Grandfather horse knows that, too. A lovely tribute – thank you for sharing! I did the same thing with MY hair — fortunately it grows on. The disappearing spots are astounding to me, because I am *that* sort of person. This is beautiful. Thanks for the early warning, but I’ll be reading all April, heart on my sleeve. Perfect …. spots, or not! I love the legacy of horse-crazy girls and Lipizzaners. So many of us hold that early memory and pass it on. Thanks for reading, but mostly, thanks for continuing the tradition. Never got to see the Lippizaners for real 🙁 Be careful what you wish for is so true – what you think you want … ha! However this has not stopped me trying to concentrate very hard and visualise, Fuego maybe. I am also trying very hard to visualise a trailer attatched to my car, sigh. I would offer to visualize with you….but it might be dangerous. Thanks for reading, and he was young, only 4. My mother didn’t like horses at all, so it was an uphill fight. I have always wondered what it would be like to have a ‘riding mother’- I am looking for her book. Again, thanks. The spot fading sounds like a developmental thing (sorry, biologist speaking here) like the color change from black to white that the Lipizzans do. I’ve just never heard of it in an appaloosa. I’m glad to hear you went after what you loved even against some resistance. I always regretted that I found riding so intimidating – but I learned so much about horses and about dressage from my mother, and I still remember a lot of it. I “loved” it at that level. My mother’s parents weren’t horse people, but she was an only child and may have been indulged. She never got my dad on a horse, but at least he tolerated her madness.